The Los Angeles Rams defense has been an elite unite the best few seasons and it’s hard to expect anything less in 2016. There are some new faces and a few franchise staples that left in the offseason, but hopes should be high for this unit in its Southern California debut. Once again the Rams front four will be the anchor of this defense. The team lost two key contributors from last season, but this shouldn’t affect their play as much as people would think. Nick Fairley was the third best defensive tackle on the Rams last season, and although the loss won’t help the depth at the position it shouldn’t be a big problem. The loss of Chris Long will certainly create a void in the locker room, but his on-the-field play wasn’t the same last season, and the Rams should be able to survive without him. The Rams added two interesting pieces to the puzzle with defensive end Quinton Coples and defensive tackle Dominique Easley. Coples hasn’t lived up to his expectations in the NFL thus far, but he has shown flashes and many believe that the four-year veteran was miscast in a 3-4 system. As for Easley, he’s struggled to stay on the field due to injuries. But there’s a reason the Patriots selected him in the first round just two years ago. He’s got plenty of potential and if healthy should be able to fill Nick Fairley’s role and maybe even more. Both guys are great low-risk, high-reward pickups for the Rams that could pay off. Additionally, re-signing Eugene Sims and Willie Hayes will keep this group as deep as ever off the edge. With the return of a healthy Robert Quinn, expect this group to be one of the best in the NFL once again. Aaron Donald has been a force of nature during his two seasons with the Rams and the fact that he is still getting better should frighten opposing quarterbacks. Quinn and Donald alone are enough to make this unit an elite one. With help from Michael Brockers, Hayes, and Sims and the potential of Coples and Easley putting the pieces together, quarterbacks are going to hate dropping back against this unit. The success of the Rams linebacking corps is on the shoulders of Alec Ogletree. The Rams let go of their all-time leader in tackles James Laurinaitis, and Ogletree has been the man tasked with replacing him in the middle. He’s certainly got the talent to be a success in the middle, but Ogletree has played outside linebacker his entire career with the Rams. If the transition is seamless, this group will be fine. But it may take a bit of time for Ogletree to be fully comfortable in the role. Next to Ogletree will be Mark Barron and Akeem Ayers. Barron experienced a career renaissance when he was moved from safety to outside linebacker last season, and the Rams made a commitment by signing him to a long-term deal this offseason. Barron has big expectations and should continue to improve on his success at the position. 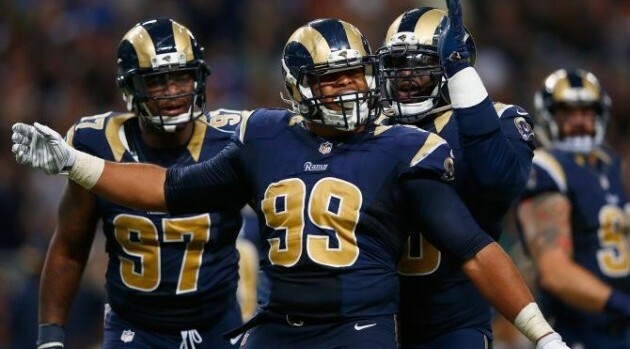 With these three players in the starting lineup, the Rams should be fine at linebacker. It’s not an elite group, but it should be a very productive one. The new-look Rams secondary will be the make or break point of the defense this season. The team suffered two massive losses by failing to resign Janoris Jenkins and Rodney McLeod. This group still has potential, but it will be interesting to see just how well they can perform on the field. The Rams chose to franchise tag Trumaine Johnson instead of Janoris Jenkins, a move that made sense. While I believe Jenkins is the more talented player, Johnson is much more consistent and more likely to agree to a reasonable long-term deal at the end of this season. The Rams will be looking to replace Jenkins in the starting lineup, and E.J. Gaines is the frontrunner. Gaines has the potential to seamlessly replace Jenkins in the lineup. He had a phenomenal rookie season in 2014 and was even selected to the PFWA All-Rookie Team. Gaines was expected to compete with Johnson for the starting job in 2015, before being suffering a season-ending foot injury during the preseason. If Gaines is healthy and improve on his rookie campaign this season, the Rams will be fine at cornerback. But things get tricky if that fails to happen. The next man up will be LaMarcus Joyner or newcomer Coty Sensabaugh. Joyner is a fine player, but I’m not sure he’d be a reliable starting cornerback and fits much better in his current role as the third corner. Sensabaugh is also better suited to being a nickelback, but the Rams spent a pretty penny to bring him to Los Angeles, and it’s expected that he’ll compete with Gaines for the job. In a perfect world, Gaines is back to health and Sensabaugh fits in nicely as a nickelback. The most glaring hole in the Rams secondary and potentially on the entire roster is at the safety position. The Rams bring back T.J. McDonald from injury, but it still remains to be seen who will line up next to him. With Rodney McLeod gone, there isn’t really a player on the roster that makes for a good choice to fill his shoes. The Rams desperately need to bring in a veteran to fill this position or the secondary could fall apart. Rumors are that Donte Whitner plans on signing with the team, which would be a solid pick up for the Rams. It’s hard to imagine Maurice Alexander or Cody Davis being the team’s next breakout star. Steve Rebeiro is a staff writer for Rams Talk and an undergraduate student at Marquette University. For more of his opinions, follow him on Twitter here.